Moments ago Reddit went insane over an Instagram story posted by Hideo Kojima. It hasn’t been long since Kojima quit Konami and established his own studio under Playstation’s exclusive game development wing. Death Stranding, an upcoming horror video game, was teased a year ago and ever since then hardly any news has left the Kojima Productions Headquarter. A few hours ago, Kojima, the mind behind the revered Metal Gear franchise, posted a photo on his Instagram. This came to be associated with their upcoming game for the PS4. Many speculate that Kojima is secretly and cleverly teasing the date for the official reveal of his upcoming game. The bottle behind the pack of business cards is surmised to be a key indicator. 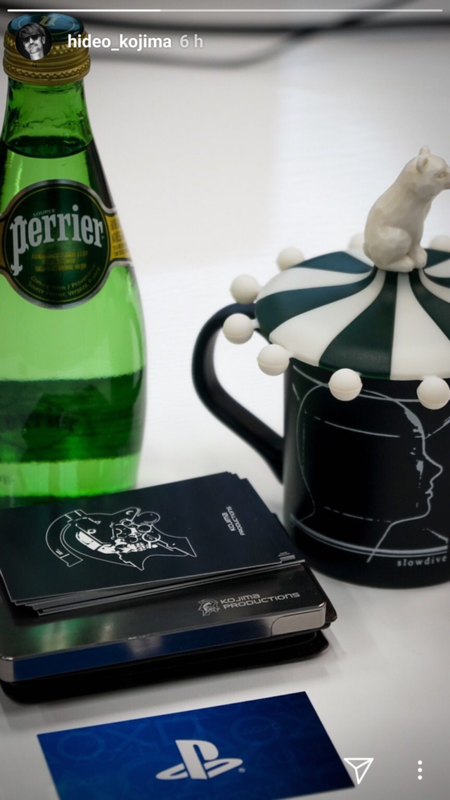 Perrier is a French brand which specialises in packaging mineral water. And the PlayStation symbol also gives away a message, that perhaps, Kojima Productions is going to publicly reveal their game in the Paris Games Week. The Paris Games Week event will begin on the 26th of October and will continue for four days. But it must be noted that whatever that has been said here must be taken with a grain of salt, for these may be mere speculations made by several devoted fans. In short, the chance of this being a rumour is still a possibility. Don’t forget to subscribe to our push-notification and never miss an update on Death Stranding. Until next time, Happy Gaming!